Vegetarians and vegans look away now! The clue is in the name at the Chop House and if you are an unashamed meat eater, as I am, then you’ll love this place! The Chop House on Market Street has been ingeniously slotted into one of the arches on Market Street, part of the new Canongate development. The design is great and the orange banquette seating is the first thing to catch your eye; the second is the meatiness of everything! A family Sunday lunch was a good opportunity to try out the gluten free options. I won’t lie: this is not going to be top of the list for gluten free eaters as the choice is not extensive. They can cater for us and do it really well, but with battered fish, deep fried squid and shrimp on the menu, it is fairly clear the chips aren’t going to work and there is always going to be a bit of compromise. Though my meal was really delicious, I was fairly limited on choice. We are largely talking about fishy starters and meaty mains at the Chop House. 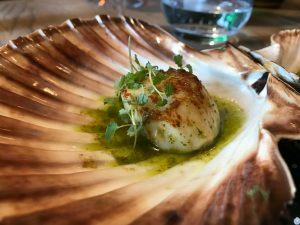 I had two sensational scallops: settled happily in to garlicy herb butter and topped with leaves – a tasty little treat at the start. Others enjoyed squid and a lot of punchy looking bread. Roast dinners are an easy option for a coeliac as they don’t require any gluten. A good gloopy bone marrow gravy like the one at the Chop House, needs no thickening agent (though at home I have always usedsometimes use cornflour) and roast potatoes, superb quality beef and vegetables are all GF. This roast dinner was a notch up: there was a delicious tiny pot of horseradish cream (made GF specially for me), delicious buttered greens and roasted root vegetables; plus the delicious roast potatoes. We had a great bottle of Tempranillo and the gluten eaters tucked into chips, stunning sirloin steak, battered fish and (of course!) some mashed potato. While the GF choices are not extensive and on days other than Sunday you will be having steak and vegetables, the quality of the meat and the fantastic friendly service are undeniable. 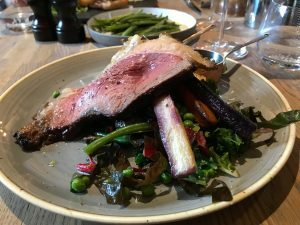 The Chop House might not be a destination gluten free restaurant, but you know if you eat there on a Sunday you will get great quality and a very good value top of the range roast dinner (£17.50). It’s worth a detour for that alone.